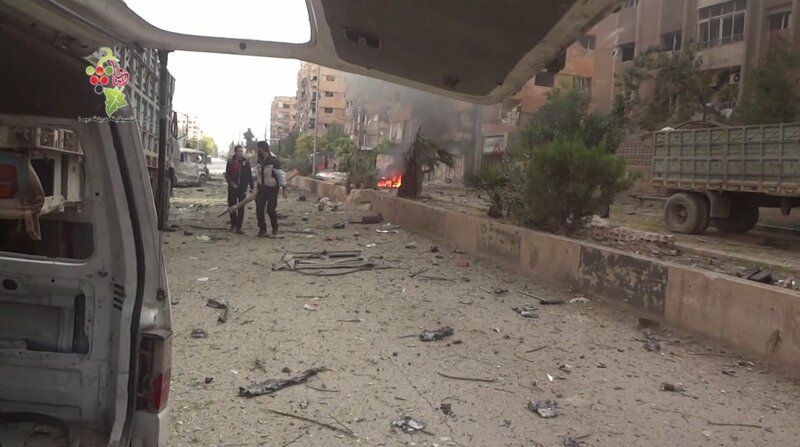 Aftermath of RuAF airstrikes on a marketplace in Arihah. Image courtesy of @FraihAlanzi. RuAF airstrikes conducted today on a marketplace in Arihah, 13 km south of Idlib, caused the death of 44. Opposition shelling of Kurdish neighborhood Sheikh Maqsoud in northern Aleppo caused the death of 4. Jaysh al-Thuwar and SDF clash with islamist opposition and JAN forces in Maryamayn, 10 km southwest of A’zaz. Reports of opposition and JAN advances being made in the area. Kurdish forces managed to take 4 JAN and islamist opposition fighters captive. 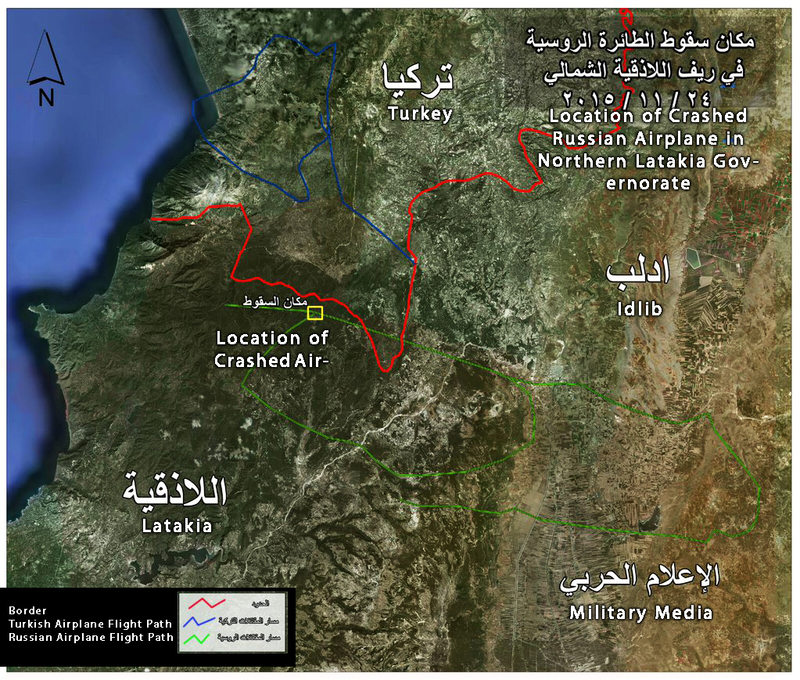 6 casualties by RuAF airstrikes on Binnish | Another opposition leader killed in Latakia Gov. battles | Kurdish Sheikh Maqsoud neighborhood under islamist artillery fire | SDF, Jaysh al-Thuwar clash with islamist opposition in northern Aleppo Gov. Binnish, a town 7 km northeast of Idlib, was hit by RuAF airstrikes. 6 casualties reported. 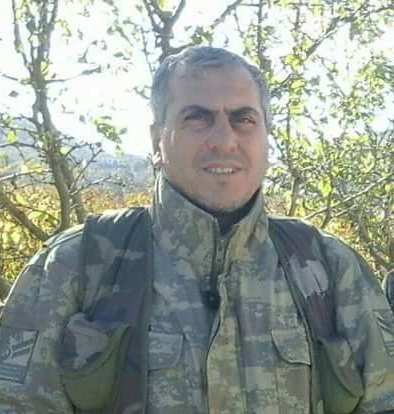 Ahmad al-Ali Abu-Ayham, leader of Ahrar al-Jabal al-Wastani opposition faction, killed in Latakia. Image courtesy of @2Rook14. RuAF airstrikes against trucks on Turkey-Syria border. Image courtesy of @miladvisor. Jaysh al-Thuwar, an opposition faction, are fighting against other opposition and JAN forces near al-Malikia, 38 km north of Aleppo. Reports of casualties on both sides. An SAA tank was hit by an opposition TOW near al-Humayrah, southeast Aleppo. Liwa Ahrar Souriya announce Kurdish-controlled Sheikh Maqsoud neighborhood, northern Aleppo, as a battlefield and demand that civilians evacuate the area. RuAF airstrikes against trucks in northern Aleppo Governorate near border with Turkey continue. 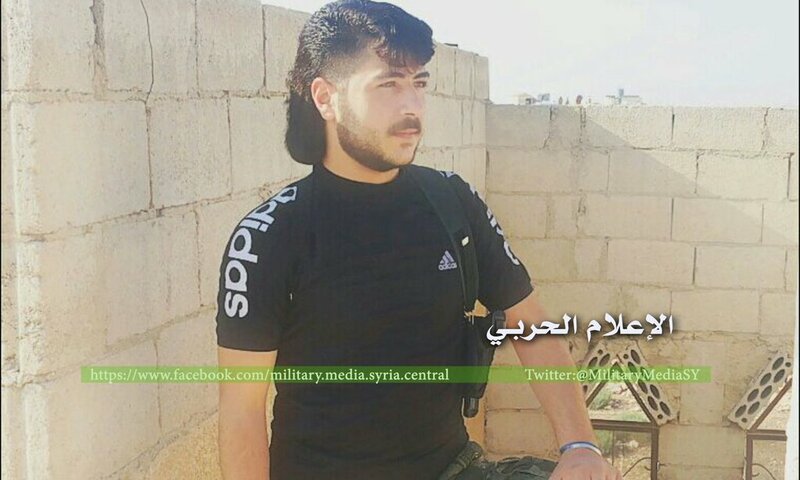 Abd al-Salam Abd al-Razzaq al-Hindawi (Abu Abdu) killed in Homs. Image courtesy of @MilitaryMediaSy. Abd al-Salam Abd al-Razzaq al-Hindawi (AKA Abu Abdu), the man responsible for transporting the Burj al-Barajne suicide bombers, was killed today by the SAA in Homs countryside. 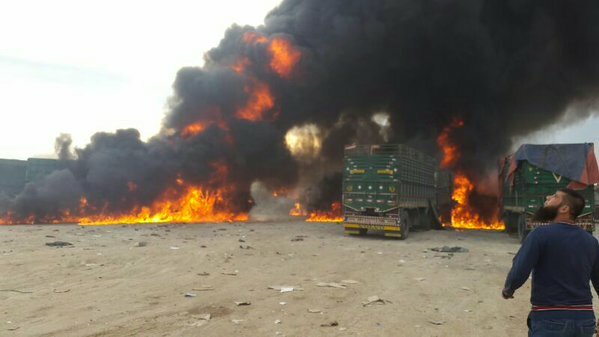 Trucks burning after RuAF airstrikes in A’zaz. Image courtesy of @تنسيقية مدينة سلقين. Reports of airstrikes by RuAF against trucks in western A’zaz after passing through Bab as-Salamah Border Crossing on the Syria-Turkey border reportedly transporting weapons to JAN and Ahrar ash-Sham fighters in Syria. SAA and Hezbollah clash with opposition, JAN, and Turkestan Islamic Party forces on Jabal al-Noba, 31 km northeast of Latakia. One opposition casualty reported as SAA advance in the area. A Turkish F-16 hit one of the two RuAF su-24 fighter jets conducting airstrikes against opposition forces after the fighter jets crossed a narrow 2.5 km Turkish-controlled area in northern Latakia Governorate. The fighter jet was destroyed as the pilot and navigator ejected from the plane. The pilot was killed by Turkmenistan opposition fighters in the area and the navigator parachuted to the ground safely. Russian officials state that the su-24s were flying close to the border yet did not cross it. Turkish officials released a map showing where the jets flew over the Turkish area, stating that the jets were warned 10 times over 5 minutes. The missile that was fired on the Su-24 hit the aircraft over Syrian airspace. A Russian rescue team arrived in the area of Kafaria with mi-24s to extract the navigator and as they landed one of the helicopters was hit directly by an Turkmenistan opposition TOW, killing one of the Russian soldiers. After 12 hours, Syrian forces managed to rescue the pilot and take him to Russian held territory in Bassel al-Assad International Airport. RuAF airstrikes continue to hit oil fields in Deir ez-Zor Governorate in an attempt to cripple the IS oil infrastructure. Russian ministry of defense reports over 1000 trucks transporting crude oil in these areas destroyed in the last 5 days. RuAF airstrikes on oil fields including geo-located Thayyem Oil Field. Video courtesy of @mod_russia. Aftermath of SAA shelling on Duma. Image courtesy of @DumaRevolution. SAA shelling and surface-to-surface rockets hit Duma causing the death of 7 including 3 children and 3 local council members. The number of casualties is expected to rise due to the severity of the injuries inflicted. Clashes break out between SAA and opposition forces in al-Moadamyeh, southwest Damascus. 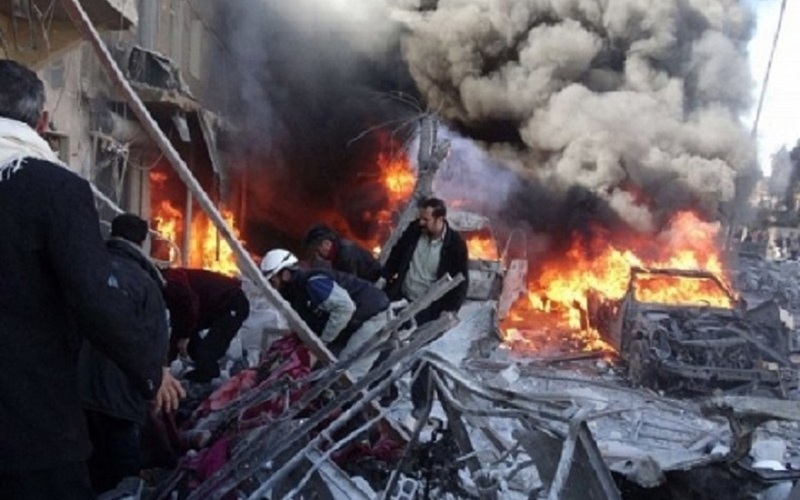 Yesterday’s unprecedented heavy bombardment of areas in Deir ez-Zor Governorate by RuAF and SyAF have caused the death of 36 including 16 women and 4 children. The number of airstrikes conducted by both air forces has reached over 70 as areas inside Deir ez-Zor, villages in the countryside, and oil fields (Tanak, Omar, Thayyem, and al-Kharrata) were targeted. 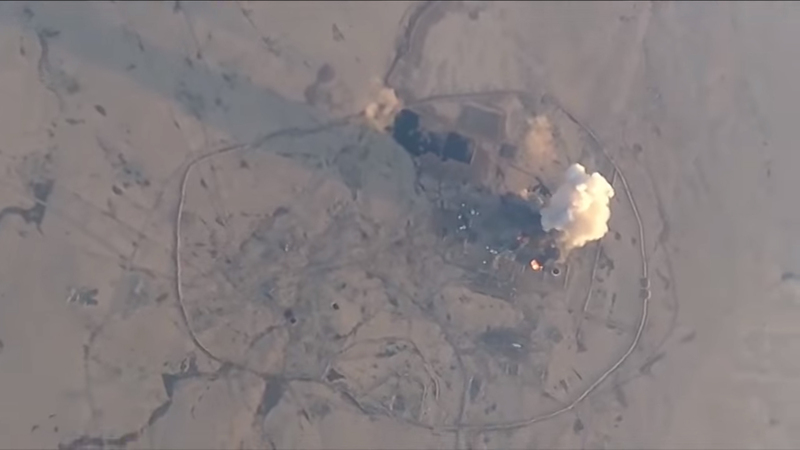 RuAF airstrike that hit Thayyem Oil Field on 20/11/2015. 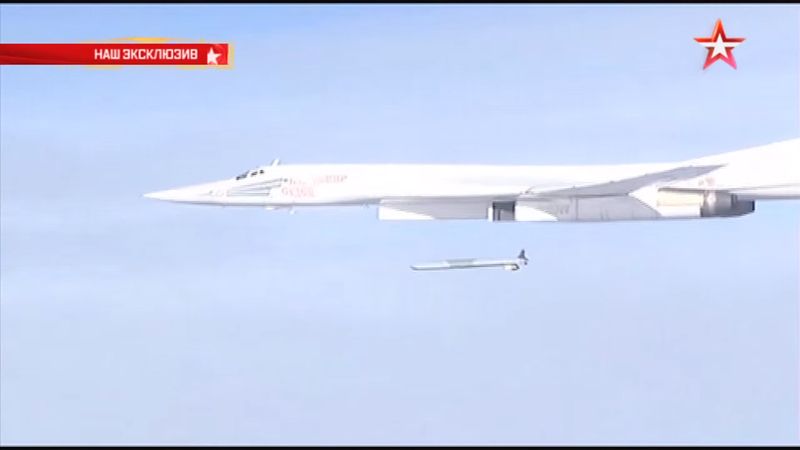 Image courtesy of Russian Defense Ministry youtube channel. 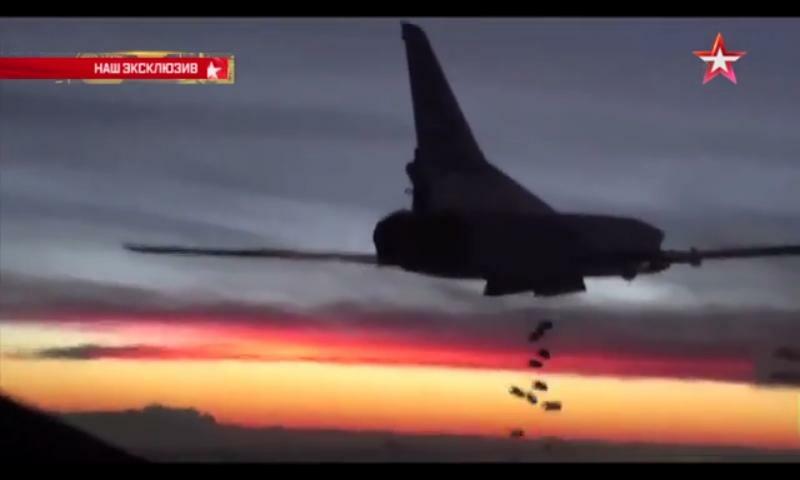 RuAF TU-22M3 bomber dropping bombs on IS locations. Image courtesy of Телеканал ЗВЕЗДА youtube channel. An unprecedented 50+ airstrikes were carried out by the SyAF and RuAF on several locations under IS control in Deir ez-Zor Governorate including al-Bukamal, al-Mayadin, al-Kharrata Oil Field, Tanak Oil Field, Omar Oil Field, and many other locations. Airstrikes carried out near al-Kasrah manage to destroy tens of IS fuel trucks. Airstrikes on the city of Mayadin caused major damage to 13 buildings. 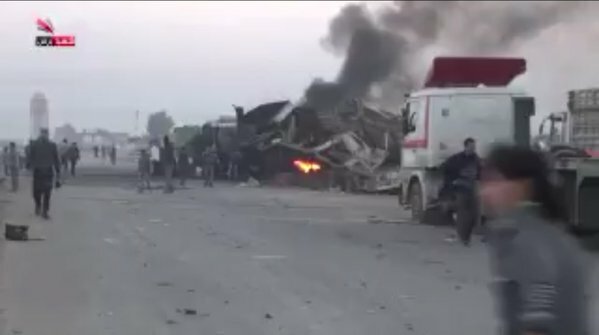 4 female and 3 young children casualties reported during these airstrikes alongside another casualty. Fighting renewed between SAA and IS forces in Deir ez-Zor Military Airport. IS launch an attack on the north and northeast fronts of the airbase. 22 IS and 8 SAA casualties during the fighting and airstrikes. RuAF TU-22M3 bomber launching a missile. Image courtesy of Телеканал ЗВЕЗДА youtube channel.